Mark Jones in action for Peterborough Sports. Peterborough Sports are in elite company in the last four of the Northants Senior Cup. The city side host National North League promotion chasers Brackley Town and FA Trophy quarter-finalists Brackley Town in their semi-final tonight (PSL, 7.45pm kick-off). The other semi-final pits Kettering Town against AFC Rushden & Diamonds. Yaxley (blue) could go top of the UCL Premier Division. It’s unlikely Brackley will send a full first team. They beat Peterborough Northern Star 3-1 in the quarter-finals. Yaxley will go top of the United Counties Premier Division if they avoid defeat at home to lowly Boston Town. The Cuckoos are one of a clutch of teams battling for top spot, but they are the only contenders in action tonight. Yaxley are a point behind top two Holbeach United and Newport Pagnell, but have a superior goal difference to both. 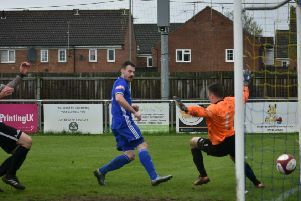 Spalding United’s home game against Frickley Athletic in Division One South of the Evo Stik League failed a 1pm pitch inspection. Semi-finals: Peterborough Sports v Brackley Town. Premier Division: Yaxley v Boston Town. Division One South: Spalding United v Frickley Athtletic - postponed.